One of the more common responses I get to the early phases of my programs is that they look too easy, especially for those riders who have some strength training experience under their belt. For a rider who has built up to doing 50+ push ups at a time (although I have yet to see 50 perfect push ups from anyone) only doing 5-20 reps seems like an insult to their pecs. Surely they should do more, right? True strength demands a balance between the two sides of the Intensity Continuum so make sure you respect and practice them both. Not so fast…I am not impressed when someone tells me that they are not challenged by an “easy” exercise. In fact, when I hear this I know that true strength has eluded that person since strength consists of the ability to not only make heavy weights feel light but also the ability to make your light weights feel heavy. You should be able to do 50 reps and be able to wear yourself out in 5 reps. When you can make 5 bodyweight reps feel like the hardest thing you’ve ever done then you truly have control of your ability to produce tension, which is the root of strength. If you are always relying on the load or the number of reps to tell you how strong to be then you don’t really own your strength. This leads us to the Internal-External Intensity Continuum. This is something I made up one day while trying to explain this concept to a rider who trains at my facility. In a nutshell, it explains where the “hard” is coming from during an exercise or workout. If you are Internally producing the Intensity – like getting really tight and staying that way during bodyweight squats – then you are purposefully producing more tension than you need to in order to complete the movement. If you are Externally producing the Intensity – like doing a max effort lift or amount of reps – then the load is causing the body to reflexively produce tension in response to it. You want every workout to be “hard”, you just don’t need or want to be going to the External side of the Intensity Continuum every time you train. Being able to benefit from the Internal side will round out your strength and support the other side of the spectrum. This explains how you can have a “hard” workout without training balls-to-the-wall every time you hit the gym. When I tell riders that they should walk out of the gym during week 1 of a new program knowing that they could do more the old bodybuilding mindset starts to creep in – how can you get results if you don’t max out every time you train? Notice, though, that I didn’t say that the workout should be easy; you should simply not max out how much weight and how many reps you can do. If you don’t have the ability to internally produce more tension than the weight or reps call for then this sounds ridiculous, however, for those who have learned the art of strength this makes total sense. For example, during my current training phase I have a workout that calls for me to do 3 sets of 8 reps on the deadlift. I wanted to use week 1 to set up the next 2 weeks and so I didn’t want to go too heavy or I would not leave myself anywhere to go. So, I used conservative weights and built up to doing 185 pounds on the last set. During week 2 I built up to 205 pounds and then in week 3 I hit 225 pounds for 8 reps, which was my max effort – I walked out knowing I couldn’t have done 1 more good rep. While a bit off topic, I’m going to finish the cycle with 3 sets of 5 reps with 205 pounds to back off a bit after my peak effort. The point is that if you look at the weight progression (185 pounds to 225 pounds) my week 1 effort looks easy – its 40 pounds less than my max weight. However, I can tell you that week 1 was not easy (I was there). Week 1 was more on the Internal side of the Intensity Continuum, Week 2 was in the middle and Week 3 was on the External Side of it, making every week “hard” in its own way. This concept also applies to training phases and plans. You have to spend some phases focusing more on the Internal Side and some on the External side of the Intensity Continuum. This is why the early phases in my workout programs confuse some riders – my programs advance from Internal Intensity focused phases to External Intensity focused phases and since they have never been told the value of working on the Internal side of the continuum it makes no sense. Unfortunately, our training culture seems to have largely forgotten and dismissed the Internal side of the Intensity Continuum. Go heavy and hard or go home is the battle cry for thousands of well meaning riders limping their way to the gym or “boot camp”, never realizing that there is another side to the strength coin that is needed to complete and round out their strength. So if you have an “easy” workout then take that as a chance to work on the Internal side of the Intensity Continuum, not as a chance to breeze through it and tell yourself how super fit you are. For a lot of people it will be very humbling to realize how little body and tension control they really have but with focused practice it will come pretty quickly. Make sure that you have a balance of Internal and External Intensity focused exercises, workouts and phases in your overall program. True strength demands a balance between the two sides of the Intensity Continuum so make sure you respect and practice them both. 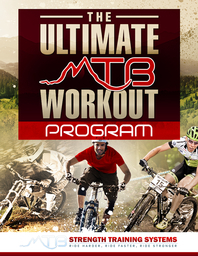 3 lessons every mountain biker should learn from how track athletes train. Calisthenics is a good example of this.simple bodyweight exercises but done often slowly with variations to make them incredibly challenging. Also Doug McGuff talks about performing exercises as slowly as possible for maximum gains.Not directly mountain bike related but it shows that different workout philosophies can attain better results than the go big or go home attitude.